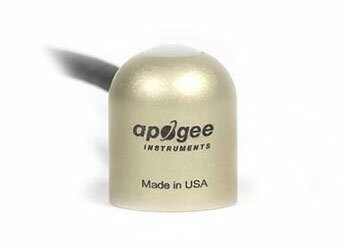 Apogee offers two types of pyranometers; our original silicon-cell models and our new line of thermopile pyranometers, both of which are now ISO 9060:2018 Class C rated (previously known as second class). Silicon-cell solar radiation sensor models are excellent for applications that do not require the higher accuracy and cost of a thermopile pyranometer. They are less expensive and have a faster response time, but have higher errors under cloudy conditions. Our new cost-effective thermopile pyranometers features a blackbody thermopile detector that provides a much broader and more uniform spectral response for better performance in all atmospheric conditions that compares favorably to other thermopile pyranometers at a fraction of the cost. Applications include shortwave radiation measurement in agricultural, ecological, and hydrological weather networks, measurement of global solar radiation, and optimizing photovoltaic systems. Available in multiple analog options and attached to a hand-held meter with a digital output. If you can't access the videos via Youtube, click here. SP-110's are integrated as part of a PV monitoring system for a PV power generation facility on the roof of the Jin Jeop library in Korea.